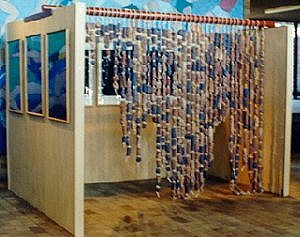 The structure for this exhibition was inspired in many ways by the Japanese screen and its potential for creating a type of mural that could be felt and viewed from both sides. Then came the idea of suspending the forms and creating individual pieces which were modeled by the hands and which rested comfortably in them. Each feature is unique and alone can evoke several different feelings. The opportunity to walk among, and be caught up in, is not just the opportunity to touch, but to be touched ... an occasion when you may have a trailing rope gently trace up your forehead and lift a hair out of place ... when a form rests for a moment on your shoulder ... when the finger tips that investigate a feature are encouraged by the back of the hand to experience a profile rubbing against it. These forms are organic and have grown in the time that has passed since I first started making them, passing through a variety of experiences and moods. Taking the many abstracted features that make up this mural and the collection of drawings, I see forms that are bones unfleshed from physical contact, desires to hold and be held. In essence the forms are physical ... physical memories ... records of physical presence. My ability to reproduce in my minds-eye a visual image of the people I have met, know, love and respect, is weak. For me the images are feelings, both physical and emotional, that are strongest in their tactile qualities and in voice.